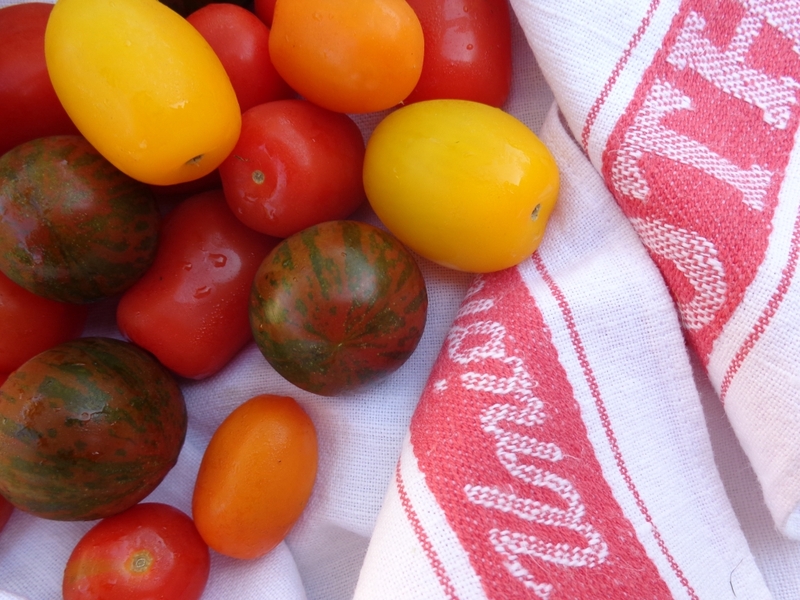 Summer is the absolute best time to eat tomatoes and basil and I think I have a little bit of a food crush on them. 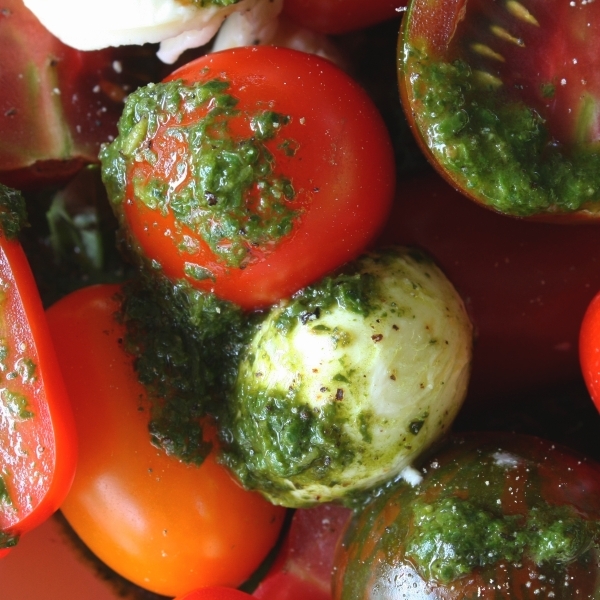 This salad uses both; fresh tomatoes and a basil dressing which is both sweet and sharp. 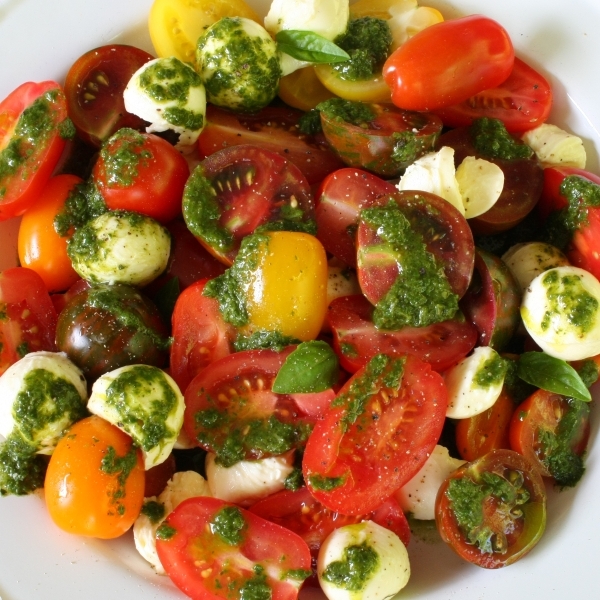 The addition of little soft and squishy bocconcini takes it to another level with the creamy chewiness of the cheese a perfect foil for the tomatoes and basil. On top of that, it takes all of five minutes to put together. Who wouldn’t love it, love it, love it?!! 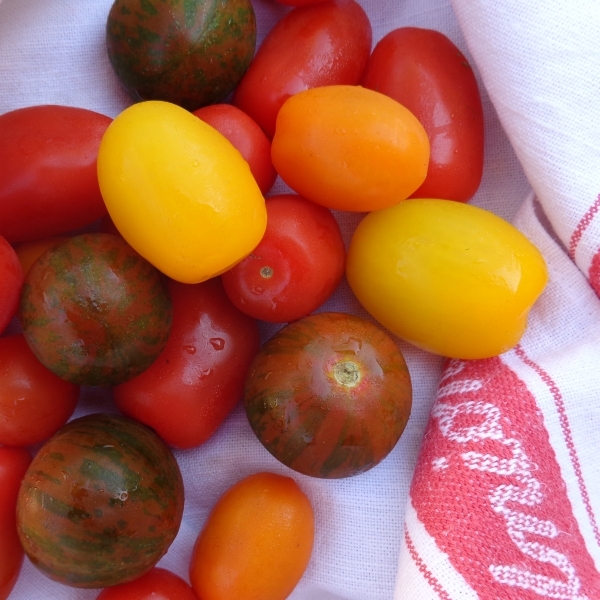 Slice the larger tomatoes in half, and leave little ones whole. Do the same with the bocconcini; tear some carefully in half and leave others whole. Blend together the basil, olive oil and white wine vinegar until it is a quite smooth and bright green dressing. (I use a small blender) Season with the salt and black pepper to your taste. Put a good tablespoonful of the dressing on a serving platter and use the back of your spoon to spread it evenly. Place the tomaotes and bocconcini on the platter and then spoon over the dressing. Grind over a little more black pepper and serve to your soon-to-be-wildly-enthusiastic lunch or dinner guests. Oh do it! 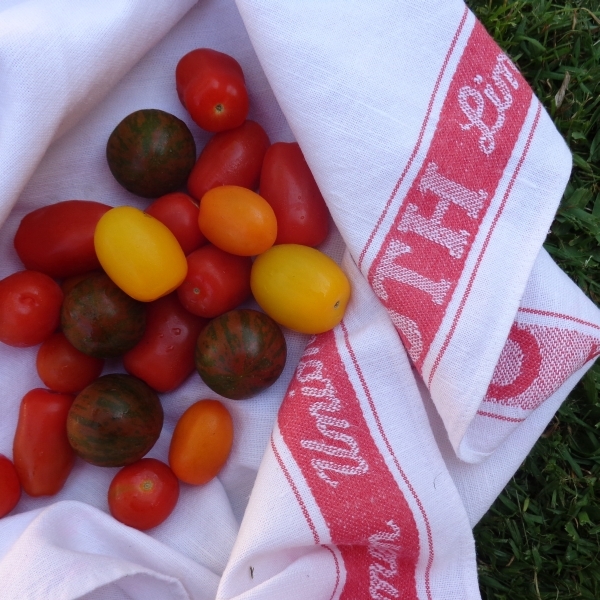 I love growing tomatoes because they are so much better than bought ones. I actually grow them over the winter because in the middle of summer it is too hot and humid and they don’t cope. So if you are growing them in the English summer, I’ll be growing them at the same time in Brisbane. Wild! Thanks so much. Our basil is just going nuts at the moment so using it in lots of cooking!